Hello all, Im new to the AHA and all grain brewing for that matter. My question is, Im looking to do a dry Hop on a Lagunitas IPA clone and have never done this before. Is it safe to rack off to my keg hang the hops and purge any air from the keg off with CO2? Is this a common practice when dry hopping? 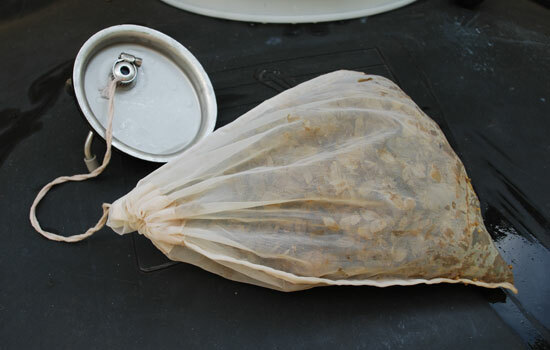 what are some of your favorite methods of dry hopping? Yes - very common in fact - I typically put a couple ounces in the hop bag tie it off with some Teflon tape and snake it between the oring gasket and the lid. Leave it long enough that it will pull the hops off midway through consumption. I do this with unwaxed/unflavored dental floss tied around a hop bag. I only use whole leaf hops now, pellets always make such a mess. Thanks guys for the feedback. Never thought of hanging the hop bag in that fashion, I was contemplating tacking a stainless hook on the inside of the lid. had seen it done before, but your idea is much simpler in the time frame im working with. So do you thin just set your carb to serve pressure and thats that? leaving the hops dangle till the keg runs dry? Yeah - sometimes I do and other times I pull them. Lately I've been blasting them with 3oz/5gal in primary so I haven't needed to do so in the keg, but it's all up to you! Some lids have a recessed well for the pressure relief valve, you can us a SS hose clamp to fasten the bag/floss there. Or the plumbers teflon tape works well under the o-ring. Having tried many different methods, including racking to Brite tank/'secondary' then dry hopping, hopping in primary after fermentation, hoppng in keg, I have to say my favorite method so far is tasty mcd's method where you add a lot of dry hops (2-3 oz for an apa, 4-5 for an IPA) at the tail end of fermentation in the primary for 2-3 weeks (I don't 'secondary' anymore). I find that the grassy/vegetal flavors are driven off but the good volatile oils remain. Add them when the bubbles slow to about every 5 seconds. Tasty actually says in the podcast on IIPAs that it drives off any potential oxygen, to which hoppy styles are particularly vulnerable. I use a 45cent muslin bag and weight (sanitized shot/heavy glass). Some dispute whether the weight is necessary. I've had good results w weight and no weight. Adding while fermentation is still active is what supposedly ensures that the oxygen is removed from the hops and the beer. I want to do this method with coffee beans for a stout or porter, just to add that extra aroma/flavor. My preferred method is to tuck a hop sock containing whole hops between the out-tube and the wall of the corny about 1/3 from the top of the keg. thanks for the pic Dean! Good idea, Dean. Thanks for sharing. I know some pros who do this, but they pull the beans or serve the beer after 3 days. Any longer and they don't like the flavor profile.